Geological exploration exposed over 150 deposits of metallic minerals within the Baikal basin. 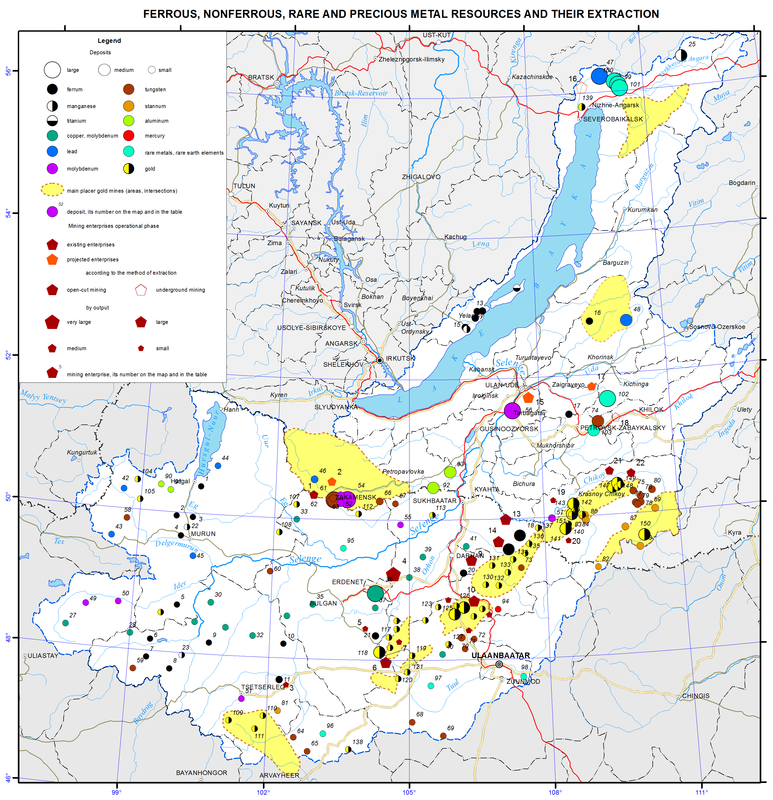 Ferrous metals are represented by a number of iron ore deposits of different genetic types, including two small magnetite deposits, namely, Balbagarskoe in the territory of the Khorinsky municipal district of the Republic of Buryatia and Baleginskoe in the Petrovsk-Zabaikalsky district of Zabaikalsky krai. In the 18th-19th centuries the Baleginsky mine supplied iron ore to the Petrovsky plant to procure iron and steel for the mines of the Nerchinsky district. In the Olkhonsky municipal district of Irkutsk oblast small iron ore deposits are known; they are mainly represented by brown iron ore deposits (Borsoiskoe, Kuchelginskoe, etc.). In the first half of the 18th century, ore from these deposits was used for the needs of the Anginsky (Laninsky) ironworks. The most promising iron ore deposits of Mongolia are the skarn type deposits such as Tumurtolgoy, Bayangol, and Tumurtey, forming the Bayangol iron ore zone in the north of the country. Currently, iron ore deposits in the region are developed only in the territory of Mongolia: small scale extraction of iron ore is underway on the Zakhtsag and Tamir gol deposits; over the recent years, the production on the deposits of the Bayangolskaya iron ore zone amounted to more than five million tons; primary processing is performed at the cleaning plants near the deposits; iron-ore concentrate is exported to China. The Oldakit manganese deposit, medium in terms of reserves, is located in the Severobaikalsky municipal district less than 30 km from the Baikal-Amur Mainline. Given the fact that Russia is currently experiencing shortage of this raw material, the deposit may be of some interest. Moreover, several small deposits of manganese are known within the boundaries of the Baikal basin, including the Ozerskoe deposit (Olkhonsky district) developed in the 19th century for the needs of the Nikolaevsky ironworks. Nonferrous metals. Almost all reserves and resources of copper ores of the region are concentrated in complex copper-molybdenum and molybdenum-tungsten deposits of Mongolia, located within the Selenginsky volcanoplutonic belt. From 1978 to present a large deposit Erdenetiyn ovoo has been developed; on its basis a joint Soviet-Mongolian venture, the Erdenet Mining Company was established. The plant is engaged in open-pit mining and primary processing of copper-molybdenum ores and is one of the world leaders in the production of copper concentrate. Currently, the production output amounted to more than 25 million tons of ore, while the production of copper concentrate is about 350 thousand tons. In a globalizing world economy, the company faces the challenge of marketability of its products, which necessitates the construction of a copper-smelting plant. 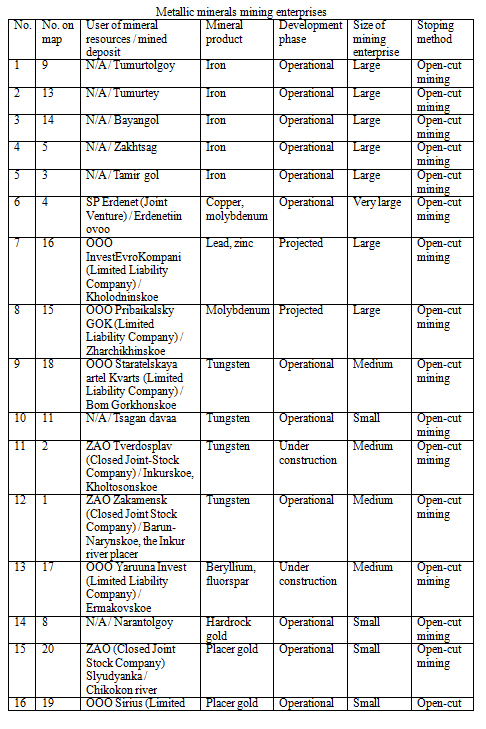 At present, the Erdenet Mining Company comprises a pilot plant for the production of pure cathode copper from off-balance and storage ore dump piles of KOO (Limited Liability Company) “Erdmin”, which is a joint venture of Erdenet Mining Company and the American company RCM. Within the Baikal basin, the largest Kholodninskoe deposit of lead-zinc sulfide ores is explored and prepared for industrial development; its reserves amount to 11.2% of Russia’s total lead reserves and 34.1% of Russia’s total zinc reserves. Based on the economic indicators of development, the deposit is on par with the best world analogues. According to the feasibility study of final mining parameters, the annual production of the underground mine at the deposit should amount to three million tons of ore, 504 thousand tons of zinc concentrate, and 60.3 thousand tons of lead concentrate. In order to ensure environmental safety of production, provision is made for a circulating water supply system, transportation of wastes of the ore-dressing plant outside the catchment area of Lake Baikal using pipelines, and a number of other environmental measures. However, due to the fact that the deposit is located in the Central Ecological Zone of the Baikal Natural Territory (BNT), where mining activity is banned, the production license, owned by the KOO (Limited Liability Company) “InvestEuroCompany” was suspended until 2015. 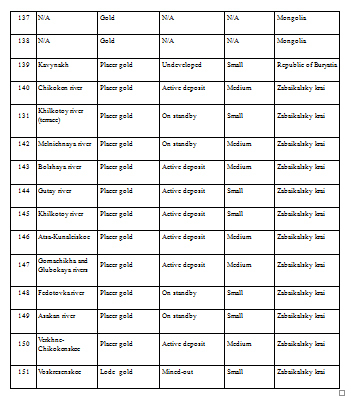 Among other objects of polymetallic raw materials in the region, the medium Davatkinskoe deposit, discovered and assessed in the Khorinsky municipal district of the Republic of Buryatia, should be pointed out. In Buryatia there are two large deposits of molybdenum ores, namely, Zharchikhinskoe and Malo-Oinogorskoe, and small Pervomaiskoe (abandoned) and Dolon-Modonskoe (undeveloped) deposits. There is a project of the construction of the Pribaikalsky mining and processing plant on the basis of the Zharchikhinskoe deposit, located 40 km to the south of Ulan-Ude in close proximity to the highway and railway, with the molybdenum content in the ore of more than 0.1% and high technological and technical-economic indicators. Its effective development is possible, provided that all necessary environmental requirements are observed. Tungsten in the region belongs to widespread elements. In the territory of the Zakamensky municipal district there is the Inkurskoe deposit of the stockwork geological-industrial type, which is comparable to the largest similar deposits of the world in terms of its reserves and tungsten content. The Kholtosonskoe deposit, located to the west of the Inkurskoe one, is the largest deposit of the vein type in Russia, and is considered to be unique not only in Russia but also in the world as to its characteristics. The Dzhidinsky tungsten-molybdenum mill operated from 1934 to 1996 on the basis of these two deposits as well as the Pervomaiskoe molybdenum deposit. After the closure of the mill, the tailings pond remained over the area of more than ​​one km2, forming the man-made Barun-Narynskoe deposit, the development of which has been started by OAO (Open Joint Stock Company) “Zakamensk” since 2010. A reclamation plant recycling the mill’s waste was built 1.5 km from the town of Zakamensk; the concentrate production amounts to about 300 tons per annum. ZAO (Closed Joint Stock Company) “Tverdosplav” is engaged in the construction of mining sites at the Inkurskoe and Kholtosonskoe deposits. It is planned to build a modern ore-dressing plant and a hydrometallurgical workshop for the processing of tungsten concentrates to produce commercial refined tungsten compounds. In the Petrovsk-Zabaikalsky municipal district of Zabaikalsky krai the prospectors' artel “Kvarts” mines the medium Bom-Gorkhonskoe tungsten deposit by the underground mining method. In recent years, the concentrate production amounted to around 600 tons. The remaining tungsten deposits within the territory of the Russian part of the Baikal basin are temporarily abandoned or are on the governmental standby. A number of tungsten deposits are known in Mongolia. A small tungsten refinery plant was built on the Tsagaan davaa deposit; the concentrate production amounts to about 40 tons per annum; the final production is exported to the United States and China. Tin deposits located in the Krasnochikoysky district are small in terms of reserves and are currently mothballed. In the Dzhidinsky district of Buryatia the medium Borgoiskoe (Al2O3 – 19.8% on average) and Botsinskoe (21.44%) deposits of nepheline-bearing rocks are prospectively explored; currently they remain undeveloped. Rare metals. In the Kizhinginsky municipal district of the Republic of Buryatia there is the Ermakovskoe deposit of beryllium ores containing 80% of the total beryllium reserves of Russia and unique as to the grade of ore. From 1978 the deposit was developed by the Zabaikalsky mining and processing plant; in 1990 the enterprise was mothballed. Beryllium is a strategic metal essential for the development of nuclear, aerospace, and aviation industry, and instrument engineering; it is used in the manufacture of telecommunications equipment. Currently, Russia’s demand of this metal is met through imports. Whereas it is necessary to restore the raw material and production independence of the country in beryllium, it is expected to resume the production of ore on the deposit, and create production on primary processing of ore, as well as hydrometallurgical production, the end product of which – beryllium hydroxide – will be delivered to the Ulbinsky metallurgical plant in Kazakhstan for processing and producing beryllium alloying compositions and metal. The work to create the beryllium production is included in the Federal Target Program on rare metals of paramount importance. In the Severobaikalsky municipal district within the Central Ecological Zone of the BNT, three subsoil plots of the Federal importance with large prognostic resources of rare earth elements of the yttrium group are on the governmental standby. They are the Chestenskoe, Akitskoe and Pryamoy-II deposits. Noble metals. Within the Russian part of the Baikal basin there are no lode gold deposits (except the mined-out Voskresenskoe deposit in the Krasnochikoysky municipal district). Placer gold deposits are small or medium and are grouped into the gold-placer regions, namely: Dzhidinsky, Namaminsky, Yambuy-Tolutaisky, Chikoysky, and Baldzhikansky. 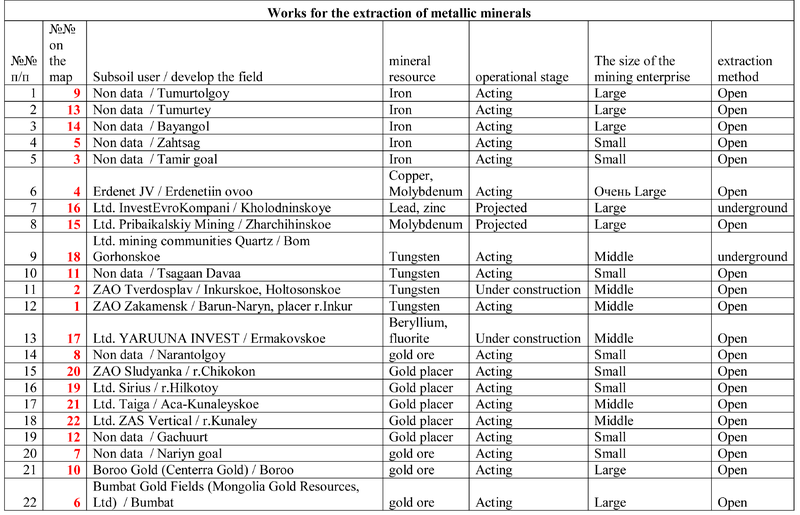 In the Republic of Buryatia within the territory under consideration gold practically has not been produced over the recent three years (economically advantageous deposits are mined-out, and exploration and appraisal works require substantial expenditures); in the Krasnochikoysky district of the ​​Zabaikalsky krai, four prospectors' artels produce 300-400 kg of gold annually using the open-pit hydromechanical method. 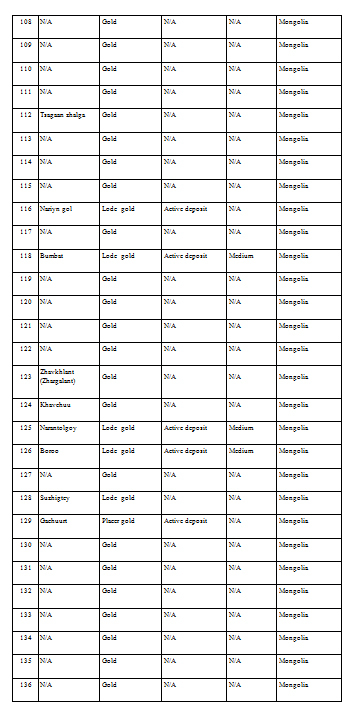 Gold is the second most significant mineral resource of Mongolia after copper. The industrial mining of gold ores in the country was launched in the early 20th century by the Russian-Mongolian joint-stock company “Mongolor” in the Iro-Gol river basin, in the Khovsgol region and in the Boroo area. Primary deposits are usually of the vein type, more rarely – mineralized zones. 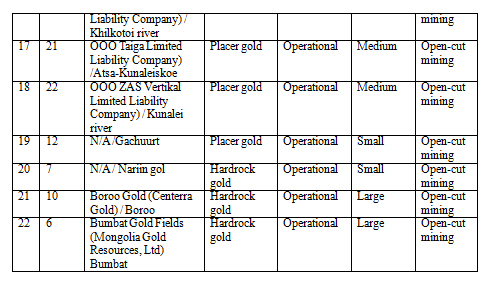 The most significant primary deposits in terms of reserves include the Boroo deposit in the Boroo-Zuunmod region and the Bumbat deposit in the Zaamarsky gold field. The metal content in individual layers reaches 10 g/t. The deposits are developed by Canadians with the annual production of five and 1.5 tons of metal, respectively. Moreover, gold is currently mined on the Narantolgoy and Nariyn gol deposits. Among the placers small and medium ones predominate, and only single ones are large placers in terms of reserves. Most placers are shallow single-layer, rarely double-layer; in rare cases deep placers occur. Dredging and separate production techniques are applied at the placer deposits. After mining by large companies, the remaining gold is mined by individual prospectors, whose number exceeded 10 thousand people according to the official data alone. In river valleys, where mining is possible, huge settlements are formed. As a result, in recent years the country faced an intensive shallowing and pollution of rivers, shrinking of grazing lands for cattle, and a process of desertification of the southern territory, and drinking water shortages for population occur. This is largely due to huge volumes of gold mining in the river valleys, illegal use of mercury and cyanides, and almost total lack of reclamation. and small ones produce less than 0.1 million tons per annum. The Erdenet Mining Company is highlighted as a very large enterprise with an annual production of more than 20 million tons. The following gradation is accepted for gold mining: large companies are gold mines with the production of more than one ton per annum, medium companies are those producing 0.1-1 ton, and small ones are those with less than 0.1 tons produced. The color of the symbol corresponds to the exploitation phase of an enterprise: operating or projected and under construction; additional outline corresponds to the underground mining method. Gold-placer regions of the given territory are depicted by areals.